Windows Sacramento | We carry wood and vinyl windows in all styles! Are you paying way too much money in heating and cooling costs each month? Believe it or not, your old, outdated windows could be to blame. If you’re looking to update your windows and make a solid investment in your home or business, contact New Door Store by EcoView to learn more about the ENERGY STAR windows we offer. As an established provider of ENERGY STAR windows in Sacramento, CA, we’re ready to help make your space more energy-efficient. ENERGY STAR windows may reduce your yearly energy costs significantly while helping to protect the environment at the same time. If you’re interested in learning more about ENERGY STAR windows, call New Door Store by EcoView to discuss your specific needs. We’ll be happy to walk you through your options and recommend money-saving solutions designed to benefit you in the long run. It’s time to put an end to high utility bills. Update your home or business with ENERGY STAR windows and get ready to be amazed at what a difference it makes. For more information, reach out to New Door Store by EcoView today. ProVia’s Endure, Aeris, ecoLite and Aspect custom home replacement window lines provide the best in beauty and durability while also delivering high energy efficiency. Their aluminum storm windows are designed to provide the best energy efficiency, weather protection and noise reduction. ProVia offers its energy-efficient, custom home replacement windows in a number of popular window styles, including double hung, casement, awning, slider, bay, bow, picture and garden windows. The double hung window is a very popular style because the top and bottom sash both open and tilt in for easy cleaning from inside your home. The double hung also offers flexible ventilation from the bottom or top—offering a safe option for homes with children and pets. Classically beautiful, they coordinate with any architectural design. If you’re looking for maximum ventilation and a wide-open view the casement window is a perfect choice. Offering excellent weatherability, casement windows are hinged on the side and open outward to the left or right. They are ideal for hard to reach areas, like over a kitchen sink, with an easy access handle that rotates to open and close. Casements express a modern elegance but the classic frame design complements any style home. Hinged at the top, awning windows open outward and upward. They are easy to open with a turn of a handle and provide ample ventilation even during light rain. The awning window lends itself to horizontal spaces and is a perfect choice for hard to reach areas. With a contemporary look, it pairs perfectly with a picture window to create an attractive configuration. Open up your home with the beauty of a bay or bow window. Designed by combining three or more windows at various angles, bay and bow windows enlarge a room with extra space and seating while increasing curb appeal with exterior dimension. 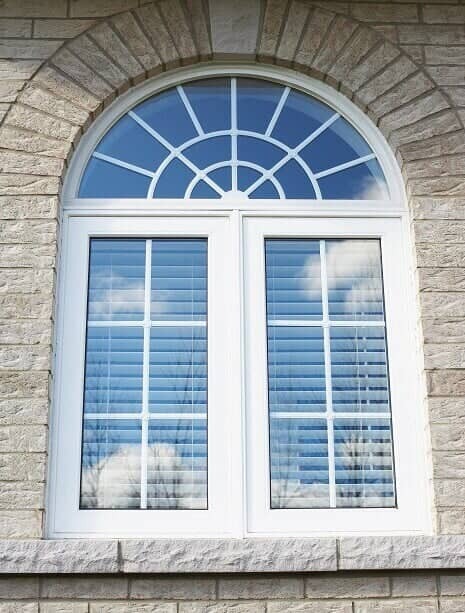 Bay windows feature a center picture window with operable windows on each side, while bow windows combined three or more windows at smaller angles for an elegant curved design. A garden window has a dimensional design that adds visual character to a home’s exterior. The interior space is perfect for a year-round greenhouse to grow plants and herbs or display your favorite decorative accents. A perfect kitchen window, the garden window has operable windows on each side for ventilation. Architectural windows come in a variety of arched, radius and linear shapes that add visual character to any home’s architecture. Ideal for small areas or combine with other windows for a large configuration. These geometric windows increase illumination and curb appeal. Select geometric shapes are also available in operable styles. Picture windows don’t open but offer design flexibility by accommodating most any size opening. With an unhindered view, picture windows are perfect if you want to open up a room to the outside and let in natural light. Combine with operable window styles if fresh air is wanted.